Marvin Vincent Archer is not a name that registers with most baseball fans, despite Archer’s 1.000 batting average on the one pitch he ever saw. He’s a relative unknown, which makes sense when you consider he’s also a fictional character who appeared in one scene of Angels in the Outfield that lasted less than two minutes. Despite his lack of notoriety and limited screen time, Marvin managed to break the matrix of baseball and pioneer a new way to play the game. You see, Marvin understood baseball down to the molecular level. When Danny Glover’s George Knox asks young Marvin, “You ever played any ball before?”, Marvin replies, “No, I’ve never played any ball” and yet still he has the wherewithal to knock one up the middle on the first pitch of his young life. Didn’t even flinch. That innate understanding of the sport caused Marvin to make one other notable contribution. When Knox yelled, “Go Marvin, run home!” after a 15-year-old brute hits a monster of a double, Marvin knew. He ran past second, past the outfield, into the street, and followed the double yellow lines to his home. Marvin knew that the point of baseball is to get home, so he cut out the funny business of bases running. I think about Marvin at least once a week. Not because Angels in the Outfield is a perfect movie and not even because his name is Marvin, which makes me think of Drake and the incongruity of a five-year old boy running home to listen to Marvin’s Room in Marvin’s literal room. No, I think about Marvin because I’ve often wondered: How many current baseball players can say they’ve run the distance between their present home ballpark and their birthplace over their baseball career? One? 10? All of them? How many bases equal a mile anyway? To find an answer, I compiled data for every position player who has a plate appearance in 2018. There were some limitations of course. I had no way of charting how many bases a player moved past the initial base he reached, unless he scored. Instead, I settled on a sum of a player’s career total bases, walks, and hit by pitches, including bases this season through August 26. Reaching by error was not included because it felt rude to capitalize on another’s failure. Stolen bases were recorded separately as I primarily wanted to see if a player could go from their baseball home to their real home based on the mightiness of their bat, but I did also record those who pilfered their way to success but we’ll touch on that more later. 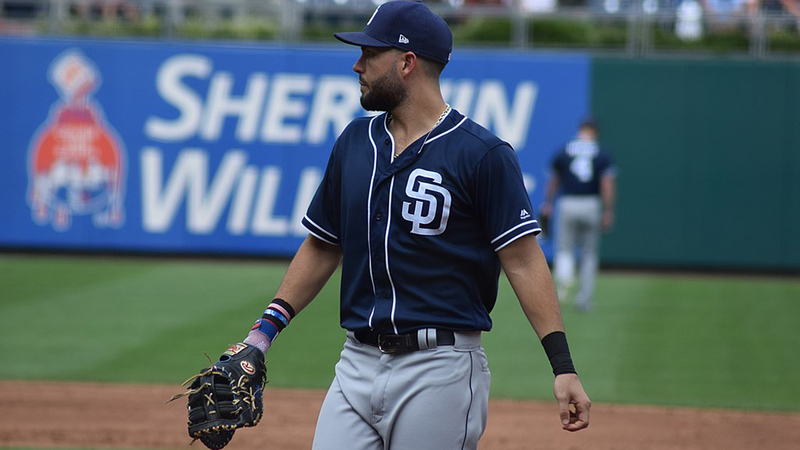 While only players who have had a plate appearance in 2018 were accounted for, the miles travelled represent the culmination of their career statistics, not just 2018. Which brings up a relevant point: Even though I could find every player’s hometown, I do not know their specific birth address, nor do I want to. For that, I followed the principle set forth by the movie Lion. Even if the player left that place soon after their birth, should they ever return to the township, they would preternaturally guide themselves the rest of the way home while flashbacks to their childhood cut between the present-day. The player just needed to get close enough. To do that, I simply plugged “[player’s birth city] coordinates” into Google and went with what the search engine returned. As far as I can tell, the coordinates provided correlate to the geographic center of the city. The coordinates used for Miami fall in the center of a highway; for Las Vegas, an art gallery; and, most fittingly, for Santo Domingo, Dominican Republic they mark the Pantheon of Heroes. Unfortunately for most of the 586 position players (I excluded pitchers entirely because no matter how many home runs Michael Lorenzen hits, he’s not getting from Great American Ballpark to the Starbucks down the street), they do not play anywhere near home. With a base equal to only 90 feet and a mile comprising 5,280, it takes a touch under 60 bases to travel a mile. That doesn’t sound too bad. I mean, Albert Pujols has travelled over 42 miles on his home runs alone! But Pujols’ home in Santo Domingo is also 3,125 miles away from Angels Stadium where he plays. That’s, far. More than 42 miles, for sure. In fact, Pujols had the most unfortunate ratio of success to futility, having recorded 119.9 miles traveled, the most of any 2018 player, but still leaving him stranded over 3,000 miles from home. Even if Pujols played in Miami, the closest baseball city to Santo Domingo, he’d still be over 700 miles away. The pattern held for all the international players. Formerly prodigious base-accumulating talents like Ichiro Suzuki and Miguel Cabrera were still 4,800 and 2,300 miles away from their home towns in Japan and Venezuela respectively, even having registered 80 and 100 miles on the base paths over the course of their careers. No matter how good or how long a baseball player stays in the league, crossing an ocean will also be next to impossible. The closest any international player got was Reds’ first baseman Joey Votto, who was only 343 miles from his home in Toronto, Canada. Playing a long ways away from where you came from wasn’t reserved for foreign-born ballplayers though. On average, players still sat 1,600 miles away from home, be it a Yankee from California or a Diamondback from Connecticut. Only 22 players even got within 100 miles of home, with most well over 1,000 miles afield. Some particularly far-flung home towns — for example Gift Ngoepe from Pietersburgh, South Africa, Suzuki and Shohei Ohtani from Japan, a handful of players from South Korea, and a few from Germany — do inflate the average. Even Forrest Gump turned around when he hit the ocean after all. So how many players have made it home? Only seven. Surprisingly, the chosen seven are comprised of three catchers and four infielders, which if anything proves slow and steady does win the race. Catchers do vaguely resemble turtles if you squint. There’s Joe Mauer, iconic Minnesota Twins catcher who was born just down the street in St. Paul, Minnesota. His 67 miles travelled easily traversed the spread of 10 miles from Target Field to St. Paul. Chase Utley recorded the most miles of the seven, with 70 miles of baserunning representing some serious overkill when his hometown of Pasadena only sits seven and a half miles from Dodger Stadium. The Dodgers were the only team with multiple players making their way home, as Justin Turner also managed to get back to Long Beach, California. Considering California is a hotbed of baseball talent, having two players based in the LA-area do it isn’t entirely surprising. The fewest miles travelled to get back home was essentially a three-way tie between Tyler Flowers of Roswell, Georgia, Marcus Siemian of San Francisco, California, and Scooter Gennett of Cincinnati, Ohio. The Braves catcher moved the least with 18 miles, followed by the A’s shortstop with 19 miles, and the Reds’ second baseman with 21. Scooter actually got two-thirds of the way home in one night last summer, when he hit four home runs covering 1,440 of the 2,165 feet he lives away from Great American Ballpark (Or, more accurately, the 2,165 feet away that the Bond Furniture store sits from Great American.). Only Gennett can claim to have traversed the distance in a single season. Which brings us to our final success story, Toronto Blue Jays catcher Russell Martin. After twelve years of moving from the Dodgers to the Yankees to the Pirates, Martin has settled in Toronto with 51 miles travelled and just four miles from his birthplace of East York, Canada. On a technicality, Martin is an international player who made it home, but he didn’t cross any borders so I refuse to categorize him as such. Some fascinating near-misses were David Fletcher of the Los Angeles Angels who was born in Orange, California and still found himself 0.37 miles away from home. He could be forgiven for that; he is a rookie after all. Brandon Crawford should make it home by the end of the season, as he’s currently only a mile away. The Giants shortstop has already covered 31 of the 32 miles he needs to get back to Mountain View, California. Mets’ third baseman Todd Frazier was the player closest to making it home while needing to cross state lines. His home in Point Pleasant, New Jersey is 48 miles away from Citi Field, but Frazier has only accumulated 35.5 miles so far. If Frazier can stick around for another three or four years, he’ll probably make it back home as he’s been averaging a bit over four miles a year. He has dipped the last three years though and is a bit of a journeyman, so even if he does it, he may not be in New York anymore. There’s still the matter of stolen bases though, the domain of the enterprising players who figured out how to add to their total having already left the batter’s box. Adding swiped bags to the total failed to get any player home, though it did cut Brandon Crawford’s remaining distance in half. The lesson here is one my mother drilled into to me from an early age: Stealing doesn’t pay. Unless you are Billy Hamilton, who, when steals were factored in, saw his miles travelled jump 31 percent from 16 miles to 21. Billy still has 550 miles to go before getting back to Taylorsville, Mississippi, but having nearly a quarter of your production on the base paths come from steals must be validating to the fastest player in MLB. Fellow Mississippi native – and the only other player for whom steals comprise more than 20 percent of their miles travelled – Jarrod Dyson, still plays 1,250 miles away from McComb. I’m sure Billy is proud that he leads the intrastate rivalry in all categories. While recording a hit still remains the most efficient way to get around the bases (you can’t walk your way into a home run after all), some players decided to make wearing pitches their preferred way on base. Chance Sisco of the Baltimore Orioles has the highest percentage of hit by pitches of anyone with more than 15 bases accumulated, at 14 percent of his total travel. I hope Sisco is a masochist because playing for the Orioles and taking that many beanings must make for a horribly demoralizing year for any other type of person. Chase Utley, the current active leader in hit by pitches, moved 3.5 miles on the bases just by staying the box. Even if those 203 beanballs are taken away, Utley still handily makes it home. Only two other players have moved 2 miles from hit by pitches, much less three. Shin-Soo Choo and Matt Holliday have both worn their fair share of pitches, but Choo won’t be making it back to Busan, South Korea any time soon, and unless Holliday keeps his second act going for approximately 79 more seasons at the same pace he logged for the first 14, he won’t be seeing Stillwater, Oklahoma either. Having learned that getting home by your lonesome was an overwhelmingly arduous task, I came to wonder what would happen if players banded together. 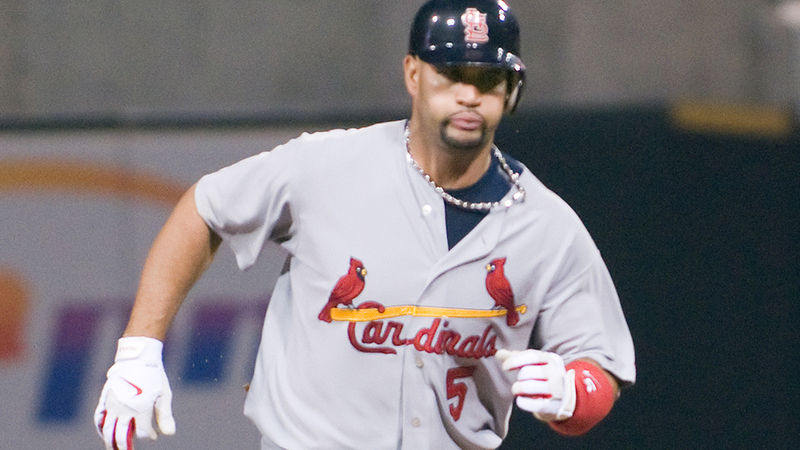 A significant number of MLB players are from Santo Domingo, Dominican Republic – Pujols and 21 others in fact. What if I added together all 22 players’ miles travelled and set them in D.C.- home of the 2018 All-Star game where hypothetically they could congregate as a team? Would they make it to Santo Domingo? No. No, they would not. Santo Domingo sits 1471 miles away from our nation’s capital. If there was ever a group that could tackle the distance, one comprised of Pujols, Beltre, Nomar Mazara, Juan Soto, Jose Bautista, Gary Sanchez, and Gregory Polanco could probably do it. But despite the group’s prodigious talent, they only made it 577 miles, running out of gas around Savannah, Georgia. I figured maybe adding swiped bags back could help Santo Domingo’s 22 native sons make it across the Caribbean. No one would accuse Adrian Beltre or Gary Sanchez of being fleet of foot, but Jorge Bonifacio or Starling Marte could perhaps pick up the slack. Except, as with the rulebook version of the sport, stealing one base at time is a horribly inefficient way to get home, even across a team’s worth of players. The Santo Domingo natives only added 17 miles to their total with stolen bases, passing Savannah and winding up just south of Isle of Hope, GA. A fitting, if sadly ironic, end to their journey. There’s little that Albert Pujols can’t do (or at least the early career version of Albert Pujols), but apparently he can’t run home like Marvin Vincent Archer can. This is fascinating. I love it so much. Thank you for bringing this into my life. Back-o-the-napkin: Albert ends up with an additional 104 miles for his BIP outs, and 428(!) miles for trudging to/from home plate (I very scientifically looked at seating charts — 2 of them — to guesstimate an average distance between the dugout and home).